Meet the baby & me Baby Cleansing Cotton, which is recommended by doctors in neonatal skin cleaning! We listened to our mothers and produced the best for them. Baby & me Baby Cleansing Cotton can provide you with the hygiene they deserve and give them full hygiene. 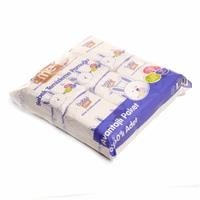 The baby & me Cleaning Cotton, developed with the advice of the physician for general body and lower cleaning of the newborn, is made of 100% pure cotton. Baby & me Baby Cotton Pad is a natural product that prevents skin, allergies and irritation. It does not harm your baby's sensitive skin. Ideal size (90 x 100 mm) baby skin cleaning provides great convenience to mothers. It has embossed cute animal motifs.